Training is one of many components in the cycle of behavioral change. 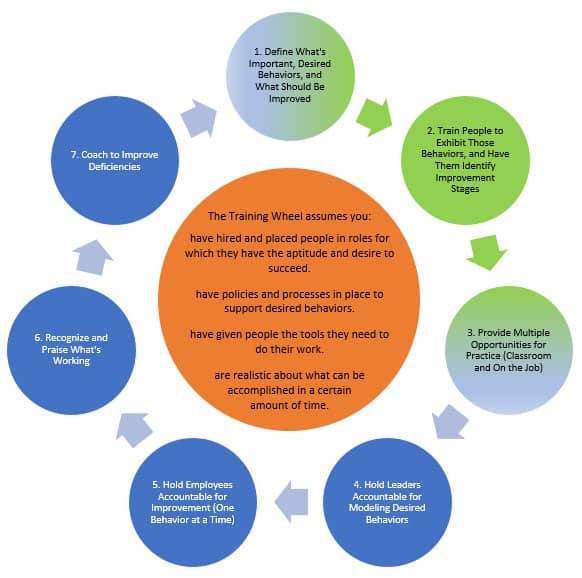 Business Training Works’ Training Wheel is a model for understanding what classroom training can do and the additional activities that must occur outside of the classroom to support shifts in behavior. Criteria that must be met for the Training Wheel to be effective. Pieces of the process we own. Pieces in the process for which we share ownership. * If you are unsure how to accomplish these steps, Business Training Works offers management training around these activities. have hired and placed people in roles for which they have the aptitude and desire to succeed. have policies and processes in place to support desired behaviors. have given people the tools they need to do their work. are realistic about what can be accomplished in a certain amount of time.